The very short tradition of the Dmitris is that one goes to an England player who has performed well this year, and who hasn’t won the award before. In 2014 I shared it between Ali, Ballance and Buttler – the new hopes for English cricket. In 2015 it went to Joe Root. For much of 2016 it was an even battle between Jonny Bairstow and Chris Woakes. It was desperately close, and it has to be said, the recent tour has not favoured the Warwickshire man (although he’s an absolute dead cert for a Wisden Cricketer of the Year, eh, Lawrence?). 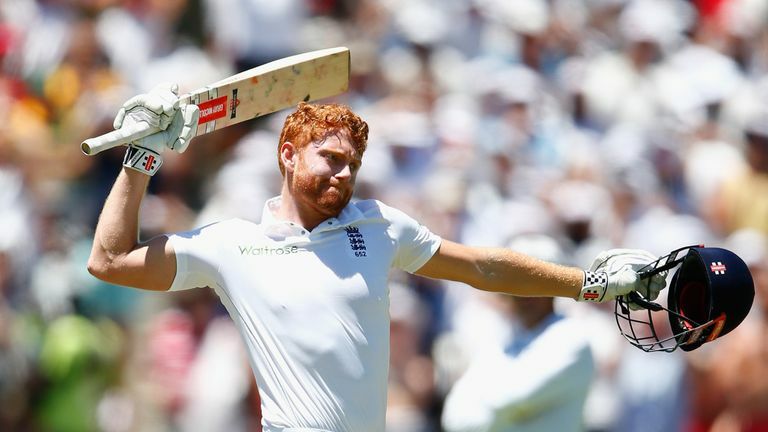 Jonny Bairstow has been a rescue act all year, scoring the most runs by a wicketkeeper in a calendar year (aided by having 17 test matches to do it, but still magnificent) and doing so by refining his game without totally reining in his natural attacking instincts. He brought in 2016 with a superb, emotional, 150 in that carnage in Cape Town. It may have been overshadowed by Ben Stokes rampage but it was incredibly important, as his batting at that time had to mask some of his keeping inadequacies. What was also lost that on a nervy Day 5 he steadied a very rocky boat with a 30 not out. That would be much of his role for the rest of the year. Jonny Bairstow had so many rescue acts to perform, he’ll be auditioning for the role of Scott Tracy in any Thunderbirds movie. The thing I also liked about his three centuries were they were all decent scores post that mark. 150 not out, 140, 167 – a DBTA of 78.5 – and although his problem now seems to be converting 50s into 100s, that is a much better problem than having extended barren spells as Jos Buttler went through before he was dropped. Bairstow has had two single figure scores in tests in 2016 (Cook has had 6, Moeen has had 8, Stokes has 4 (all on this Asia tour) which shows his consistency. Bairstow came into the team in 2012, on the back of a brilliant ODI the year before, but never settled, and then found himself thrust in the limelight of the KP phone hacking scandal! His 95 at Lord’s was ridiculously lauded by Shiny Toy – who said if he’d made a hundred it would have been the greatest first century he’d ever seen – but once he’d lost his place (after a not bad Ashes 2013, but not a convincing one), and with Buttler the coming phenom, opportunities looked scarce. Given the hospital pass of replacing Prior at the end of the Difficult Winter, he was replaced by him again in early 2014, and waited his chance. He returned for the last three tests of the 2015 Ashes, outscoring Australia’s first innings on his own at Trent Bridge, and then hasn’t missed a test since. He’s one of the first names on the team sheet. He’s also a fine ODI player, but is part of the logjam. He doesn’t let us down when he does play as his match and series winning innings in the 2015 matches v New Zealand shows. He’s also improved his keeping – Chris is a much better authority than me on the technical aspects – and I don’t see any reason why Buttler should take the gloves from him. So Jonny Bairstow is this year’s winner. Over 1400 runs, a sound old record, a man in possession and tenaciously holding it. Well played, sir.